A graduate of Manhattan College, New York, Dr. Bell-Wynter studied at the University of Pennsylvania before receiving her Doctor of Medicine with the University of Medicine and Dentistry of New Jersey, Rutgers University. Dr. Bell-Wynter completed her Internship and Residency in Internal Medicine as well as her Fellowship in Gastroenterology and Liver Disease at St. Vincent’s Hospital and Medical Center in New York City where she then became Attending Physician. 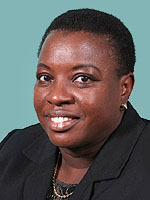 Prior to joining Hawthorn, Dr. Bell-Wynter was in practice at the St. Maarten Medical Center, Netherlands Antilles where she also served as Medical and General Director. Board Certified in Internal Medicine, she is a member of the American College of Physicians and the American College of Gastroenterology.